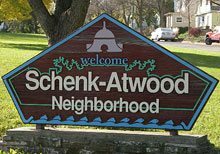 Welcome to the Schenk-Atwood Real Estate Guide! Our property listings are updated frequently, so make sure to check back regularly to find the most current homes for sale. Commonly referred to as the Atwood area, this vibrant neighborhood is comprised of a number of small sub-sections. Marquette Neighborhood as well as Schenk’s Corner are often lumped into the Schenk-Atwood Neighborhood. Close to Lake Monona, Willy Street and a number of local restaurants, you get a strong sense of community. Walk the Atwood neighborhood and stop by the Jenifer St. Market to pick something up for the family or dinner with friends. The architecture and proximity to the city center make this neighborhood a desirable place to live. Front porch conversations and a friendly east side vibe will make you feel right at home in the Schenk-Atwood Neighborhood. See all Schenk-Atwood Homes For Sale.